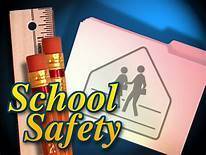 School safety is a top priority for us at Staunton Schools. To that end, there are no words to fully reflect the pain and sadness we feel from the tragic events of what happened at Marjory Stoneman Douglas High School yesterday. Their community continues to be in our thoughts and prayers as they recover. While there is no plan that can totally prevent random acts of violence, our district has plans and procedures in place in order to respond to emergency situations. During these times we review our emergency plans and responses. We request for the Staunton Police Dept. and our teachers to be even more visible and available to talk with our students. Relationships, identification, and response continue to be our best form of prevention. As part of our school family, you too are an important piece of our safety plan. We rely on you and your children to report suspicious and concerning behavior to school officials and/or local authorities so that proper risk assessments and responses can be put into place. Following are additional tips from the National Association of School Psychologists for helping your children cope with news such as this. In coming days and weeks we will be taking more action steps to improve upon our identification and response plans. We will be reaching out to you for your input and feedback. Until then, please do not hesitate to contact us if you would like to discuss these issues in more detail.